Say it ain't so! But before you go, we'd love to hear why you're leaving us (and if there's anything we can do to make you stay!). 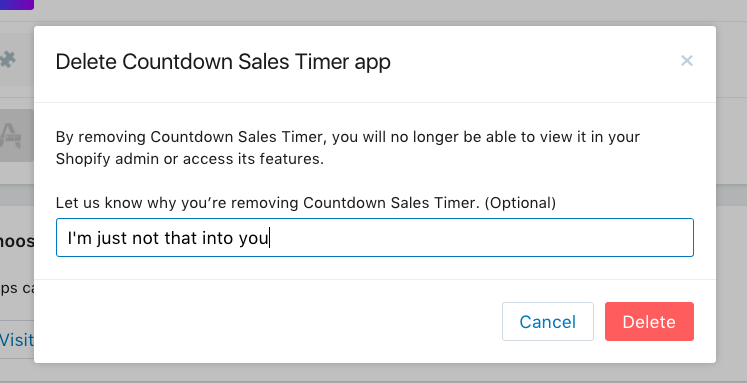 In order to uninstall Countdown Sales Timer, you must first go to your Apps page (it's at the bottom of the left bar of your Shopify admin, right above Settings). If you hit that, a dialog will appear confirming that you really want to uninstall our app. Remember, you can back out at any time! The dialog just explains that you won't be able to use Countdown Sales Timer after you uninstall it. You also will no longer be charged for it, which is nice. If you're feeling forthcoming, you can also submit your reason for uninstalling the app, which we'd love to hear about. When you're ready to uninstall, you simply hit the red Delete button and we'll be out of your hair for good!